Shopping for Sports: Wrestling Construction Toys? Build a semi-truck with a satellite dish and control center! Pieces work with all major brands. Includes CM Punk and The Rock mini-figures! 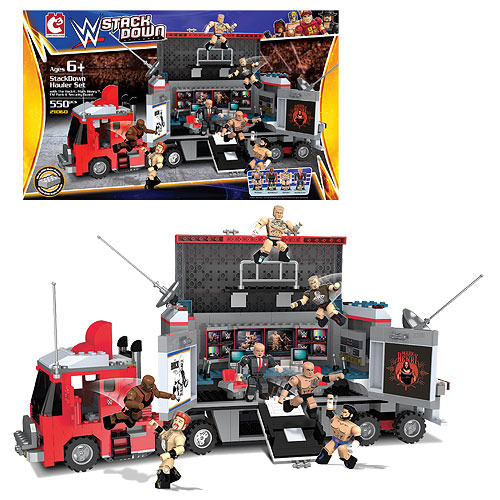 Jump right into the action with this WWE StackDown Universe Hauler Playset featuring CM Punk and The Rock! There are 550 buildable pieces total, all compatible with major brands including LEGO. With the WWE Stack Down Hauler Playset you can build a semi-truck with satellite dish and control center. Mini-figures of both CM Punk and The Rock are included.